Shawn Mendes performs as the opener for Taylor Swift during The 1989 World Tour at the Georgia Dome on Oct. 24, 2015, in Atlanta. Here are the five most popular songs in the Billboard Hot 100 Pop Singles chart, for the week ending October 31, 2015. October 31 is Halloween in the United States, and we promise you all treats…no tricks. We even have a new track for you. Shawn Mendes rises three slots to fifth place with “Stitches.” Born in Toronto, Canada, Shawn began posting song snippets on Vine in 2013 - bear in mind that Vine videos are only six seconds long - And he still collected millions of followers in a matter of months. Back in April, Shawn’s debut album Handwritten opened at number one on the Billboard chart. He’s been touring North America with Taylor Swift and has plenty of momentum going right now. Rapper Fetty Wap performs at Power 105.1's Powerhouse 2015 at Barclays Center on Oct. 22, 2015, in Brooklyn, New York. 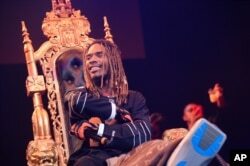 Fetty Wap and Remy Boyz take it a slot higher to fourth place with “679.” Fetty returned to the stage on October 22 after breaking his leg last month in a motorcycle accident. He performed atop a golden throne…much like Foo Fighters leader Dave Grohl, who broke “his” leg in June, after falling offstage in Sweden. Singer Justin Bieber walks on stage during a concert in Oslo, Oct. 29, 2015. Number 3: Justin Bieber "What Do You Mean?" Justin Bieber holds at number three with “What Do You Mean?” The badboy pop star took home five MTV Europe Music Awards on October 25, including Best Male and Best Worldwide Act: North America. Now, all eyes turn to November 13, the release date for his next album, Purpose. Drake performs at the Austin City Limits Music Festival in Zilker Park on Oct. 3, 2015, in Austin, Texas. Number 2: Drake "Hotline Bling"
Drake holds in second place on the Hot 100 with “Hotline Bling” – he has yet to hit number one as a lead artist. Last week, Drake released the brightly-colored video, which showed him dancing in a variety of outfits…it turns out Drake dances like the rest of us, which led to many creative Internet memes. Number 1: The Weeknd "The Hills"
This week’s top artist has only one request: please don’t pet his hair. We'll be rolling your way next week with a brand new lineup, so join us if you can.